Josephy Center Celebrates Nez Perce and Plateau Indian Culture. This is an exhibit of historical photographs and artifacts. 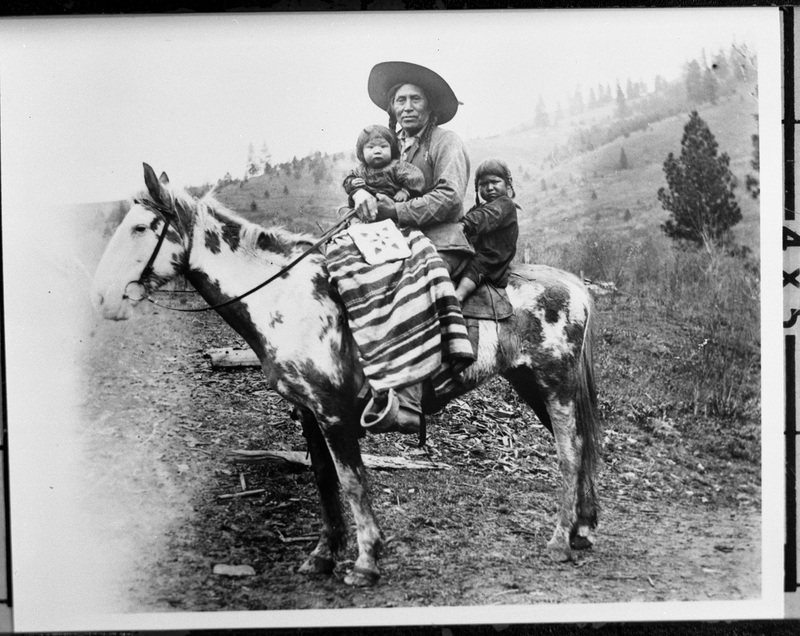 The photos are from collections at the Nez Perce National Historical Park, the University of Idaho Library, and the Wallowa History Center. This exhibit is put together by non-Indians, and includes many historical photographs taken by non-Indians. We are using these photos, along with a few artifacts from the Nez Perce National Historical Park—which were actually made by Indians—to try to picture how the People lived here before European contact. Before contact, the Nimiipuu and their Plateau Indian cousins lived across a wide area of what is now NE Oregon, Idaho, and Eastern Washington. 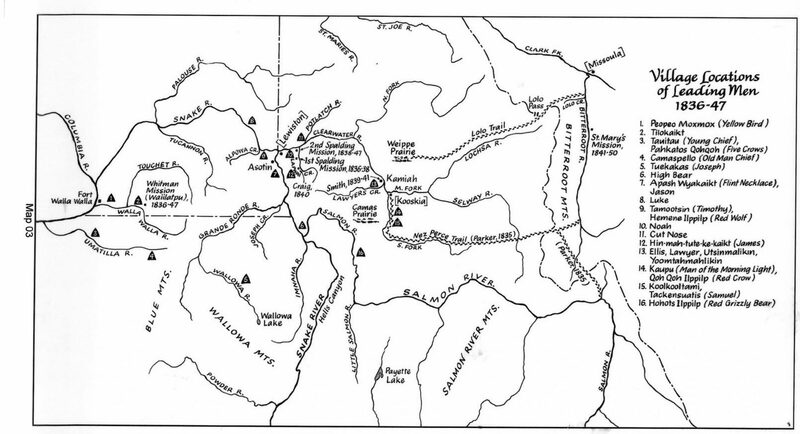 The map from Alvin Josephy’s book, The Nez Perce Indians and the Opening of the Northwest, shows the area at the time of the missionaries, with places marked by “village headmen”—and not by tribes. Admittedly, this is about 1836, so over 30 years after Lewis and Clark met the Indians of the region, but it is probable that village and tribal structure at that time was still traditional. The point is that primary loyalty was to a place and its leaders. 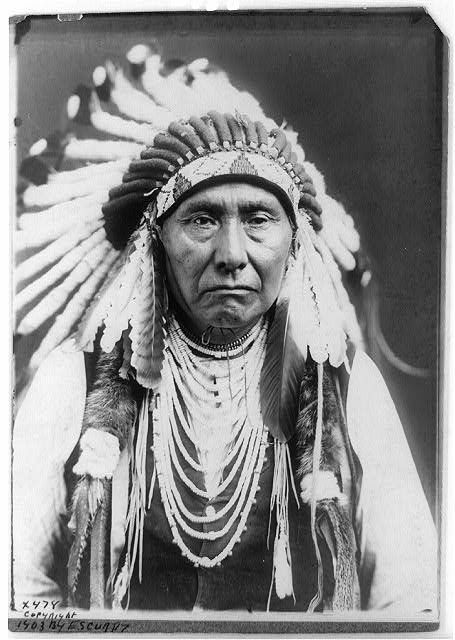 In Chief Joseph’s famous Washington D.C. speech of 1879, just two years after the end of the Nez Perce War, he refers to himself as a member of The Wal-lum-wat-kin Band of Chute-pa-lu, or Nez Perces. Chute-pa-lu is also spelled in various ways, but here is Nakia Williamson with Nez Perce Tribe Cultural Resources, on its meaning: “our earlier name was referred to as Cuupn’itpel’uu, which means ‘People Walking Out of the Mountains into the Plains.’” That self-description seems perfect here in the Wallowas. 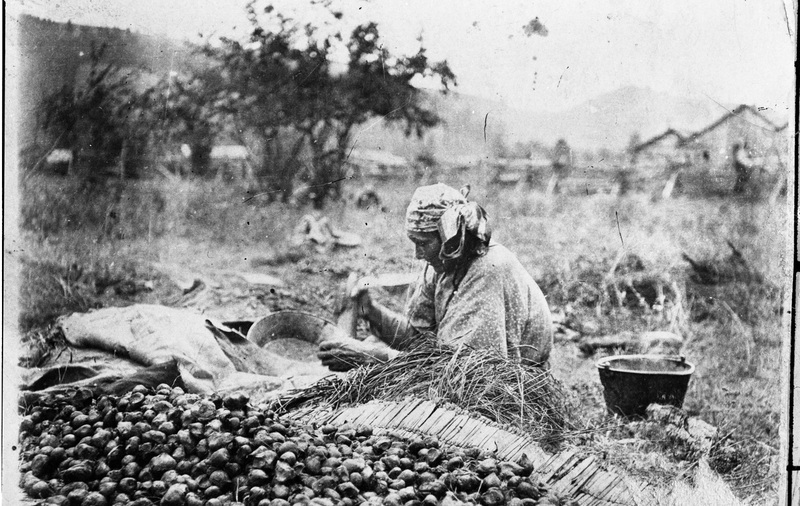 The people hovered along streams and rivers in small family groups in winter, followed the weather and the plants and animals to higher ground as the snow melted; they harvested camas and cous (biscuitroot) and, as they got to higher ground, huckleberries. At Wallowa Lake they gathered and harvested sockeye salmon—and then the annual cycle would repeat, as they would walk out of the mountains and start again for the rivers. The words “Nez Perce” are of course not Indian words, but a name put on people by French fur trappers in the late 1700s. 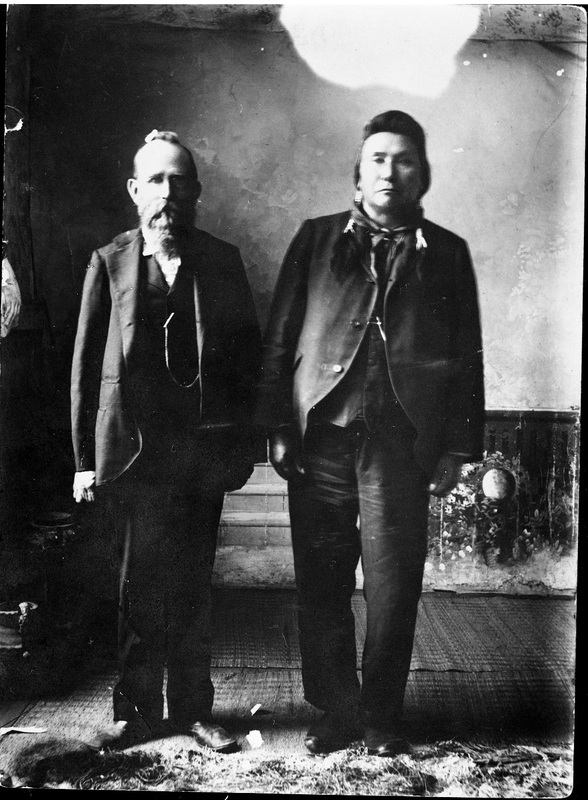 It could be that some of the Wellamotkins and tribal cousins pierced their noses with the dentalia they picked up in trade at Celilo, the great meeting place of Northwest peoples, that some French trappers saw them and put the name on them. Or it could be some distortion of Indian sign language—at any rate, the name stuck, and, by the way, the Indians pronounce it Nez Purse, and the plural is Nez Purses. Whites demanded clearer organization, “overall chiefs” and spokesmen. There were many misunderstandings because tribal peoples did not recognize an “overall chief” of the Nez Perce or any other group. And in fact, the people traveled, visited, and intermarried with linguistic and physical cousins—Nez Perce, Cayuse, Umatilla, Walla Walla, etc.—across the entire region. Finally, because the story of War and the Legacy of Chief Joseph are so large, it is good to remember that the Wellamotkins numbered only in the hundreds—a population that must have varied with conditions of the time. When the band left the Wallowas in 1877, there were probably two to three hundred men, women, and children. As the War began, and other non-treaty bands joined in the fighting flight, numbers swelled to several hundred. Lewis and Clark estimated 5,000 Nez Perce in the entire region, but elders say that was a number diminished by white men’s diseases, which had marched ahead of the fur traders as they moved west. 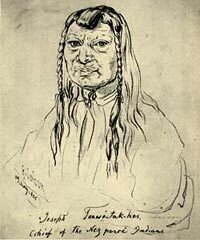 The drawing of Tuekakas, “Old Joseph,” was done by Gustavus Sohon, artist at the 1855 Treaty Council in Walla Walla. It is the only known likeness of him. In-mut-too-yah-lat-lat, Speech at Lincoln Hall in Washington D.C., 1879. Published in North American Review, Vol. 128, Issue 269, pp. 412-434. 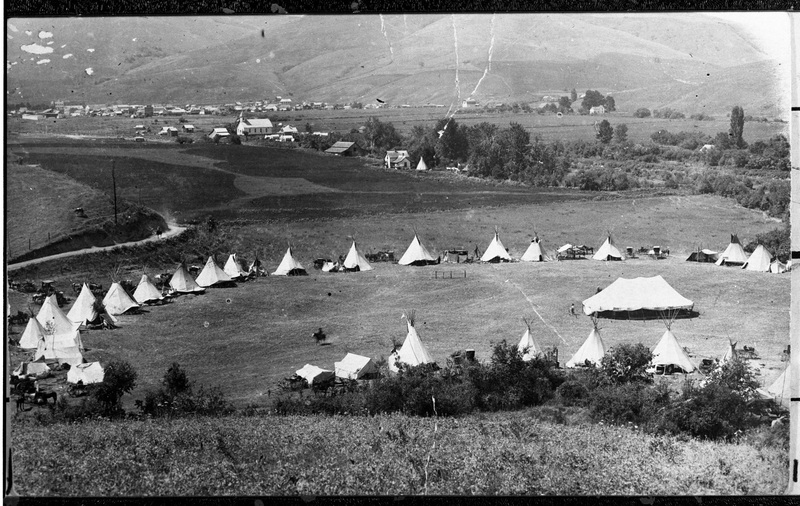 This relatively modern photo shows a large circle of tipis in the Lewiston area. The Wellamotkins traveled there to visit other bands, and one can imagine them putting their lodges in such a circle. Maybe when Tuekakas went there in 1863—and left early without signing that treaty—his band gathered like this. When Allen Pinkham Jr. was here two years ago as an artist-in-residence, he said that “we Nez Perce were canoe people,” and that he would like to come back and make a full-size dugout canoe here in the Wallowas. He will do that. Canoes—and barges made of wood strapped together—were the major means of long-distance travel before the arrival of the horse. 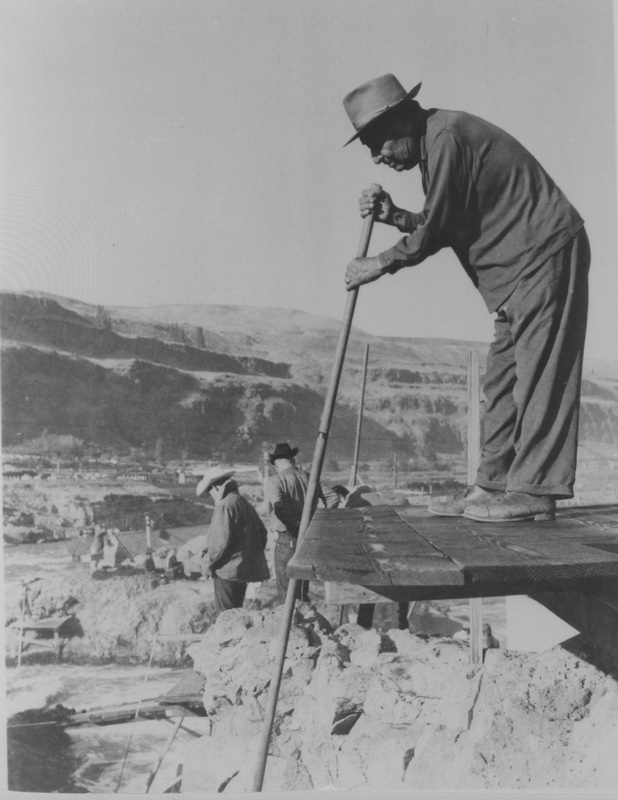 And, even after the horse, villages were often on water, and travel by canoe was still the preferred way of getting from the Grande Ronde and Snake Rivers to the regional fishing and meeting grounds at Celilo, or The Dalles. The Nez Perce helped Lewis and Clark fashion several canoes, some probably over 50 feet in length, and in the Journals they remark on seeing many canoes and few horses as they traveled on water down the Big River toward the sea. The late anthropologist Richard Daugherty wrote an essay for Alvin Josephy’s America in 1492 about the people who lived in what we now call the Pacific Northwest, a region stretching from the British Columbian Coast to Northern California, bounded by the Pacific Ocean on the West and the Rocky Mountains to the east. 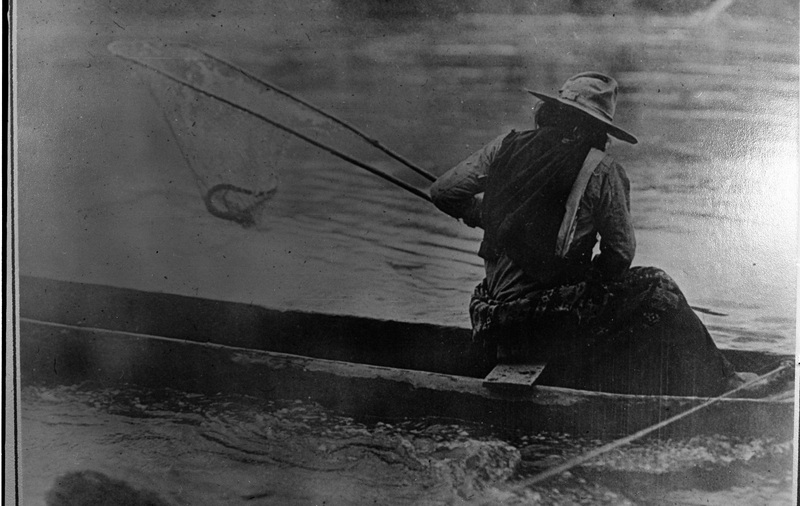 He called them all “People of the Salmon,” because to some degree or other they all caught, processed, ate, saved, and traded salmon. Coastal people had shellfish, ocean species, and sometimes whales. All the people had roots, berries, and game as well, but salmon was often the staple and sometimes the delicacy. It was eaten fresh, smoked, dried, and combined with other foods. The various species of salmon were caught in their specific runs year-around, sometimes at special places like Celilo and Kettle Falls, where the numbers were astronomical and the amount of fat and lean in the fish seemed perfect. 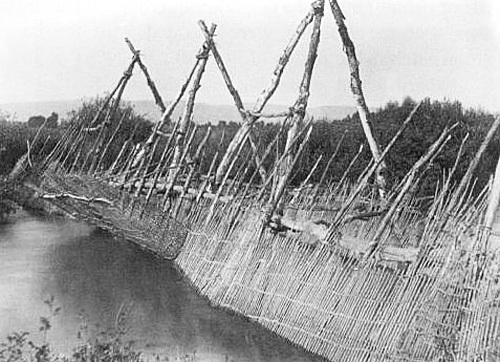 They were caught in traps or weirs across a river, with dip-nets from the banks, or with nets from canoes. 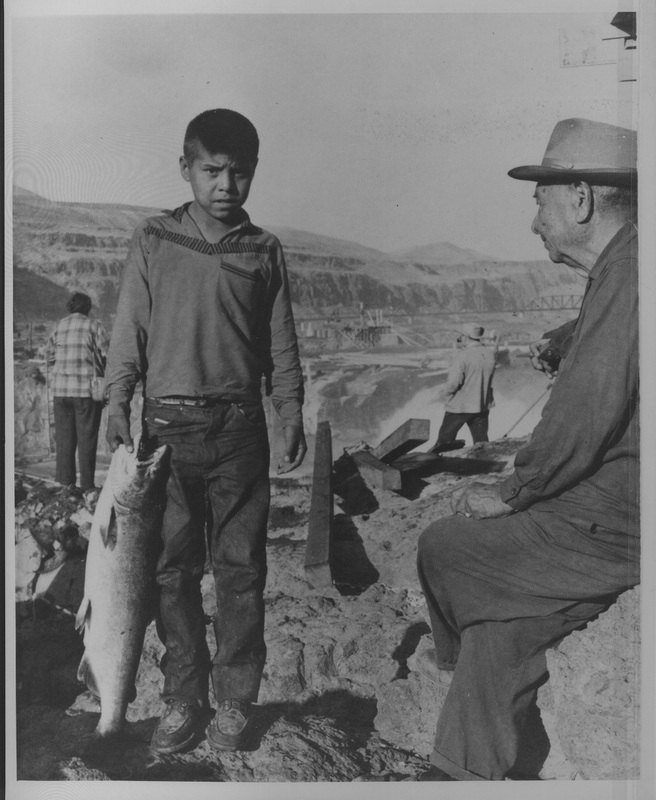 On left, Josiah Redwolf, the last survivor of the Nez Perce War of 1877, fishing near Celilo, probably in the 1940s. 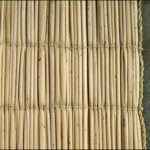 Tule mats were used to cover wikiups, tipis, and long houses. Trees were sometimes split into boards for building materials as well. 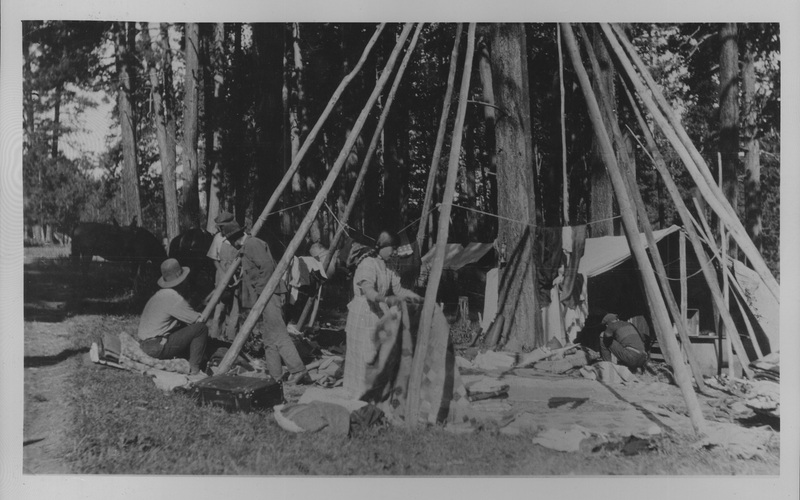 And, after the horse made travel to buffalo country easier, buffalo hides covered more tipis and longhouses. 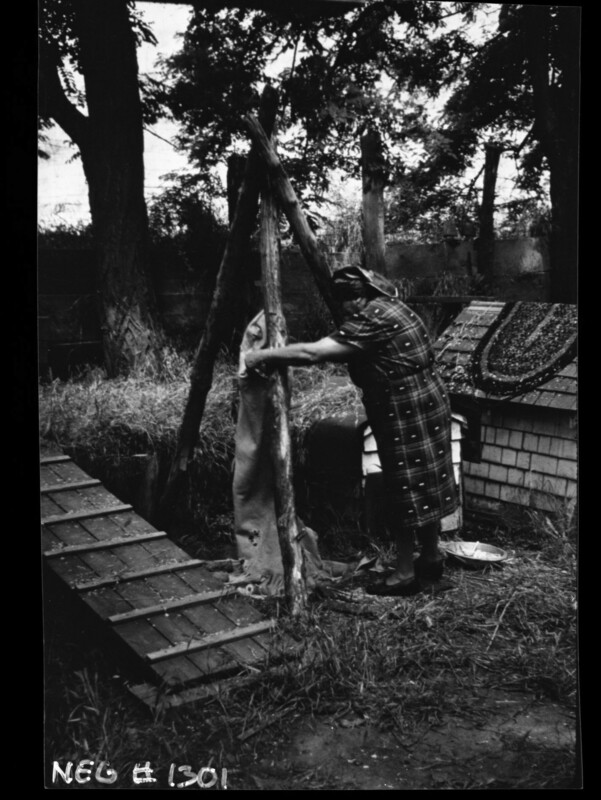 Canvas arrived with the fur trade, and made larger lighter dwellings possible. Used to hold and carry infants, a baby in a tikéʼs can see the world and learn by watching their surroundings. 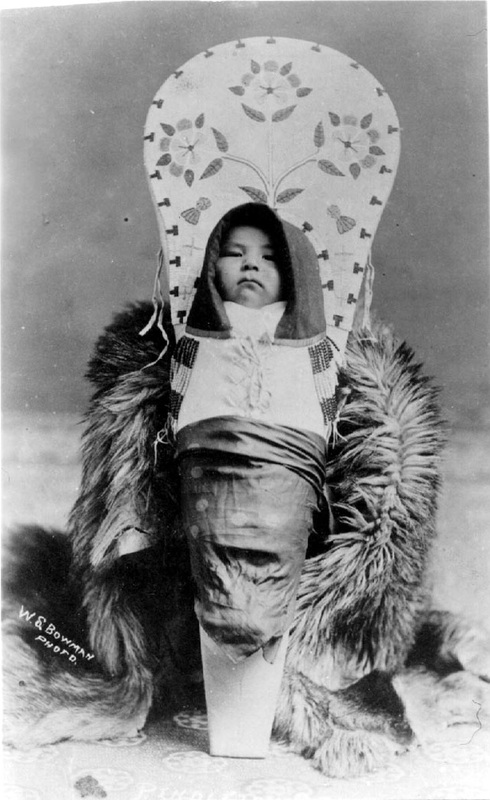 The tikéʼs buckskin mimics the warmth of a mother’s embrace and can stretch, breath and keep a baby warm and clean. A tikéʼs can be carried on a mother’s back or propped upright. 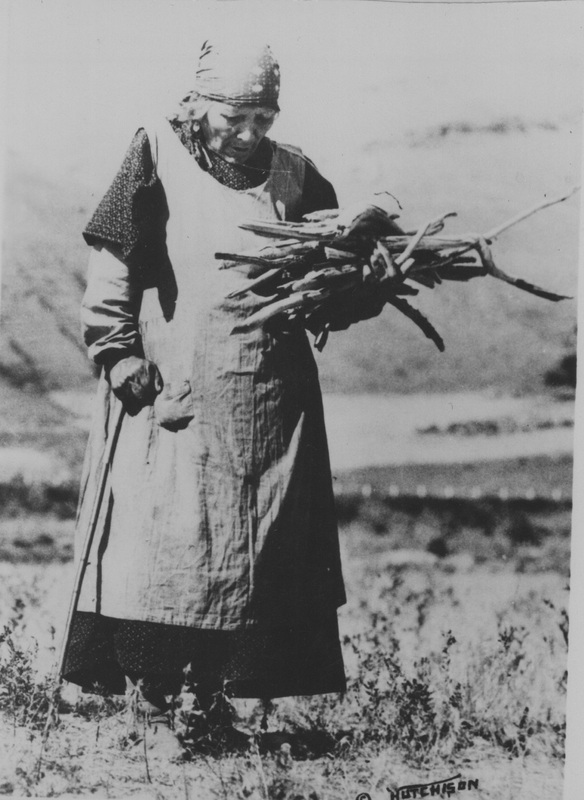 This túkes (digging stick) is used to harvest camas. The long, curved stick of the túkes is used for loosening the soil and gently removing the roots, bulbs, and other plants from the ground. This túkes is made of iron with a wood handle. Historically, túkes could also be made from the horns of big horn sheep or fire-hardened yew. The camas bulb, like salmon, is significant to the Nez Perce beyond its nutritional value. Camas, as a gift from haniyawát (The Creator), is a sacred food that is treated with respect. 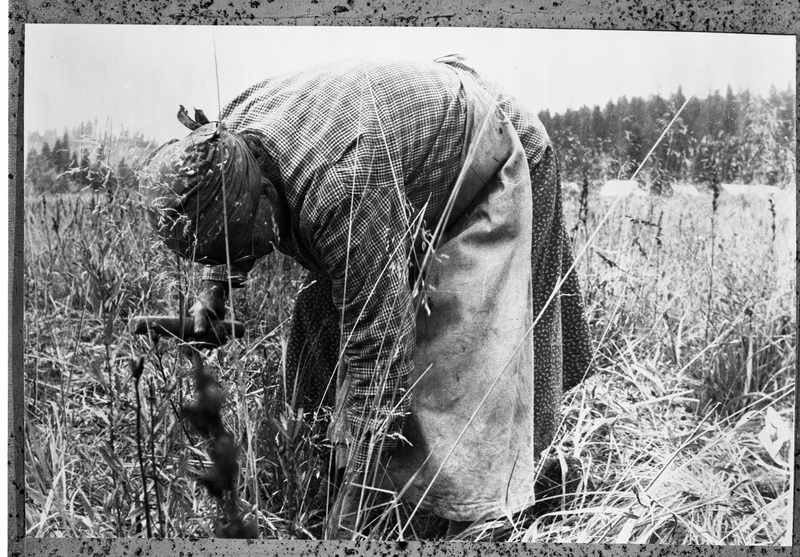 Today’s diggers, as their ancestors did, use the túkes to dig one camas bulb at a time and make sure that as little soil as possible is disturbed. 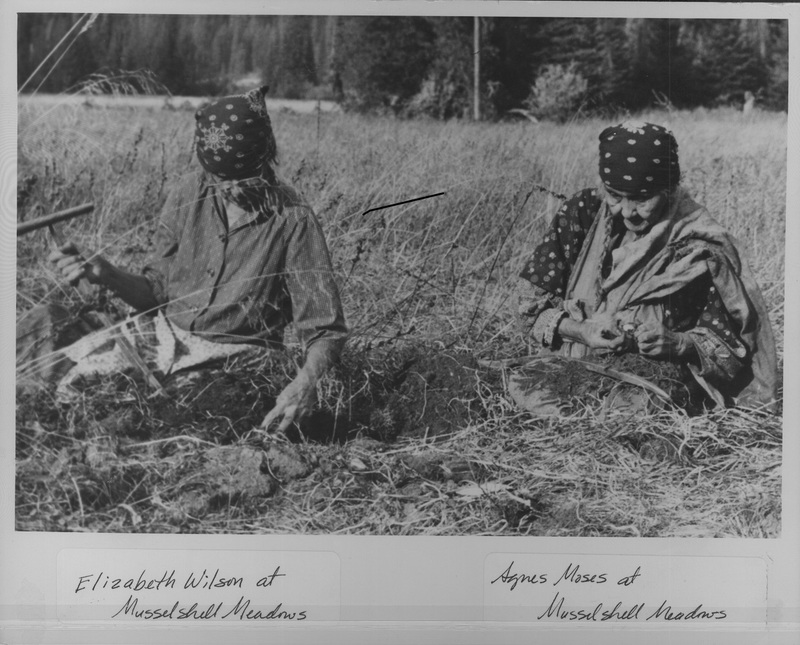 Women were (and still are) primarily responsible for harvesting and processing roots and berries, with making pemmican of meat and berries, with processing hides, making clothing, and of course with the care of tipis and children. In the past, they used what was at hand, with hide scrapers and needles made of antler and bone. 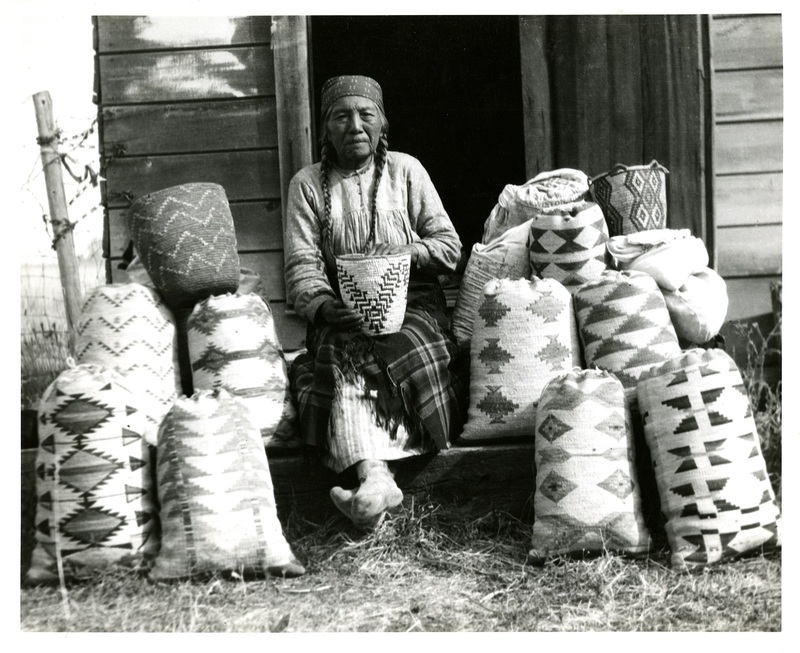 Bear grass and later cornhusks are used for baskets, and hides for parfleche “suitcases.” Although many men are extraordinary beaders today, we assume that women historically did more of that work. And women were historically and still are in charge of digging grounds, announcing when a season is open, and making sure that some roots are always left to generate the next year’s crop. Digging sticks went to iron as soon as that metal reached the region, and the digging sticks used today are not much changed. 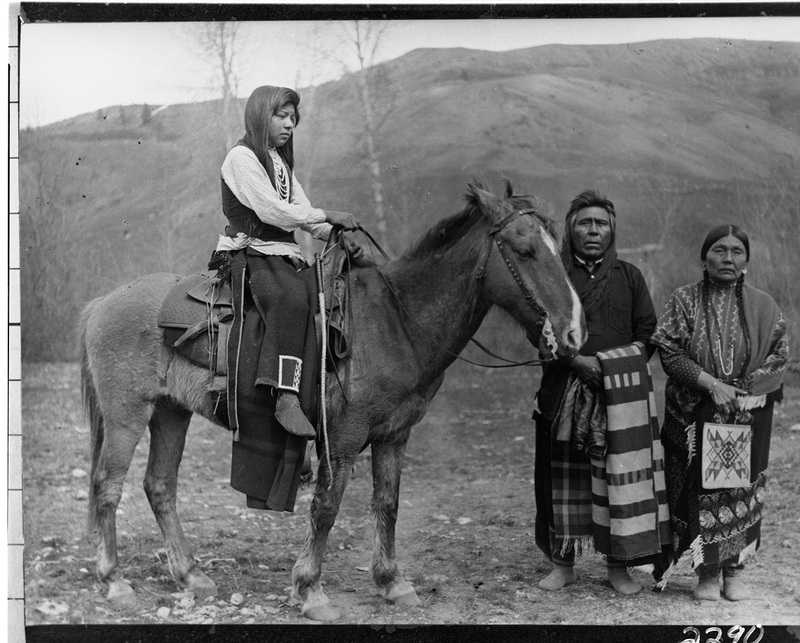 The Nez Perce got Spanish horses from the Southwest through the Shoshone about 1730. The people and the horse thrived together; Lewis and Clark marveled at Nez Perce gelding and selective breeding skills. They bred for speed and endurance, traveling more easily to the buffalo country and to fur trade rendezvous in Green River (oral history has it that they traveled to buffalo country even before the horse, but traveling east, south, and north certainly became easier with the horse. 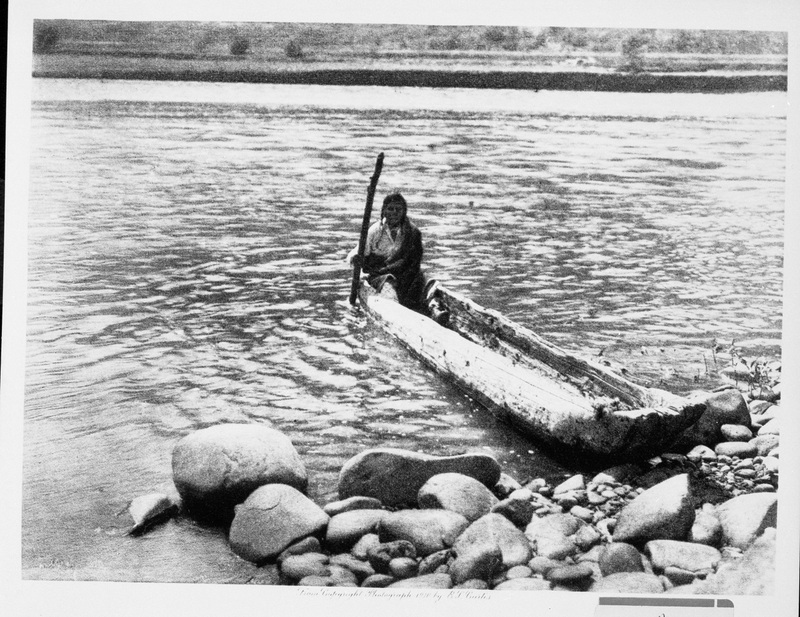 Canoes were still the way to go to Celilo.) They were not avid about fur trapping, but were enthusiastic horse traders, traveling regularly north to Fort Spokane to trade. And although there is sentiment and there was great effort by historian Frances Haines to make the Appaloosa the “Nez Perce War Horse,” there is no evidence for it. 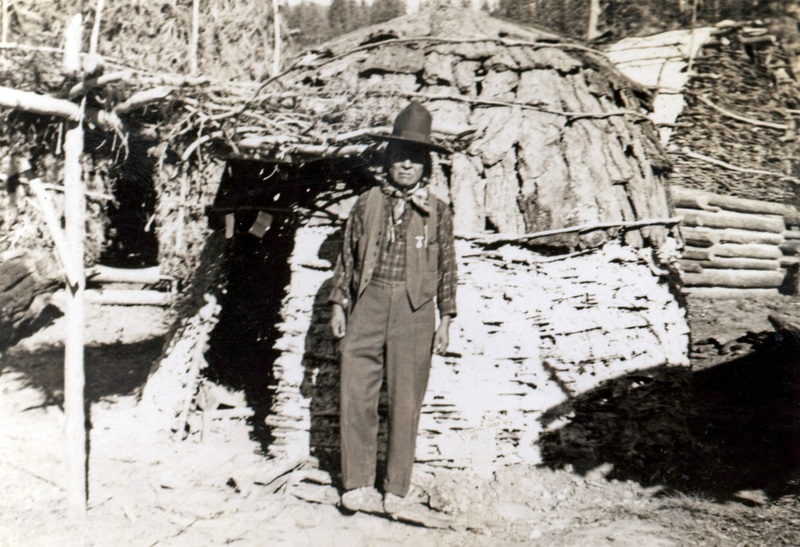 Alvin Josephy built on information from local historian Grace Bartlett and her Nez Perce husband, Harry Bartlett, to counter all of Haines’ arguments. Some individual Nez Perce might have favored spots, but all were interested in performance and speed. 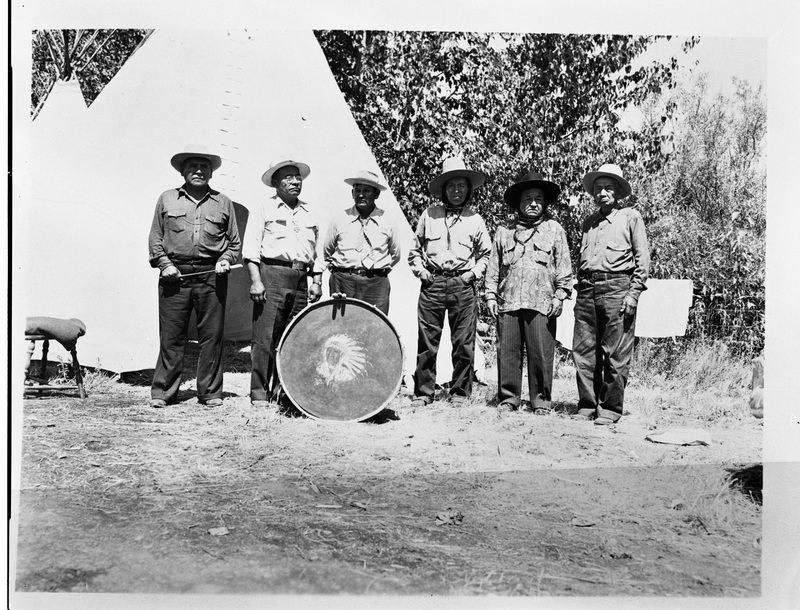 It is important to note that the Nez Perce acquired cattle in the 1840s, and that 19th century treaties that hold today allow the Indians to hunt, fish, gather, and graze horses and cattle in “usual and accustomed places.” The Wallowa Country was home, and is still a usual and accustomed place for the Nimiipuu. 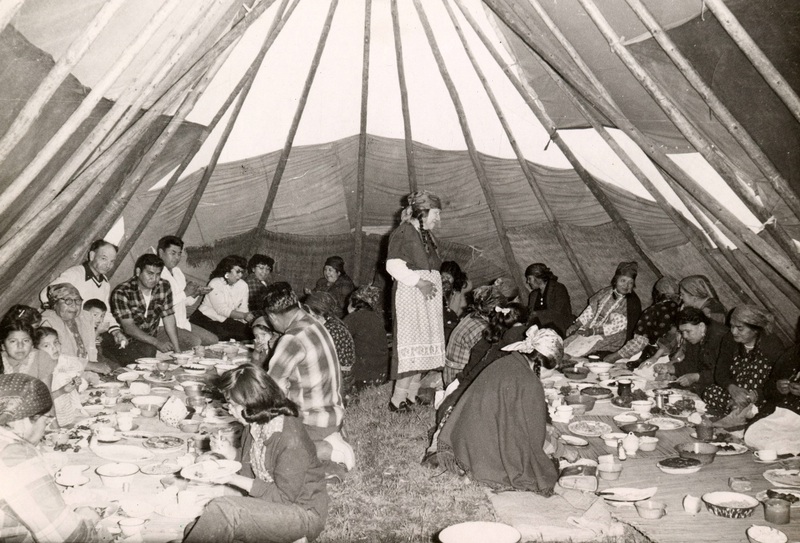 These photos—of a communal meal, people putting up a large tipi, and one of drummers in front of a tipi, are all relatively modern, but all involve traditional activities that involve community. Tradition is easier to maintain when it is practiced and witnessed by many. Some of the photos—and the artifacts in the accompanying collection—are modern. Of course there were no photographs before the Europeans came, and even then most of the photos—of Indians and whites—were studio photos, because of the limits of the equipment of the day. 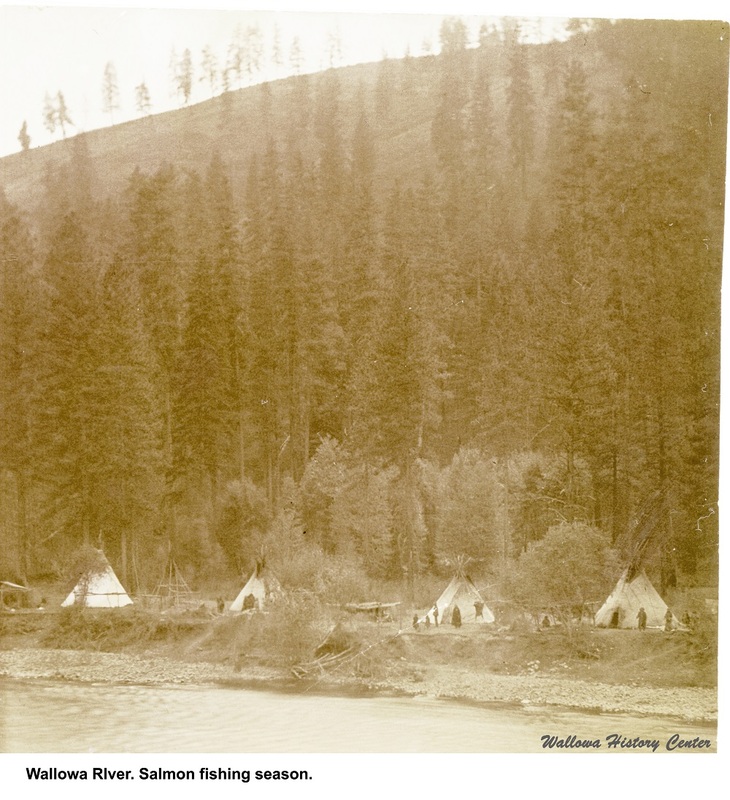 So we are lucky to have photos of tipis along the Wallowa River, of men on horseback carrying dip-nets on a gravel road with fence posts to the side. We’re lucky to have photos at all of In-mut-too-yah-lat-lat—Young Joseph—at a time at the end of the War when he was in his 30s, and then again shortly before his death in 1904. 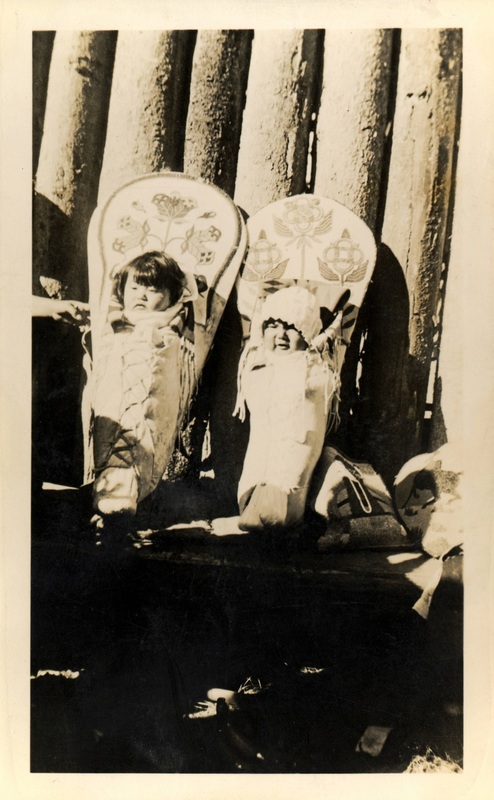 The latter was taken by Edward Sheriff Curtis, who had a studio in Seattle where he hosted Joseph and University of Washington historian Edmond Meany. 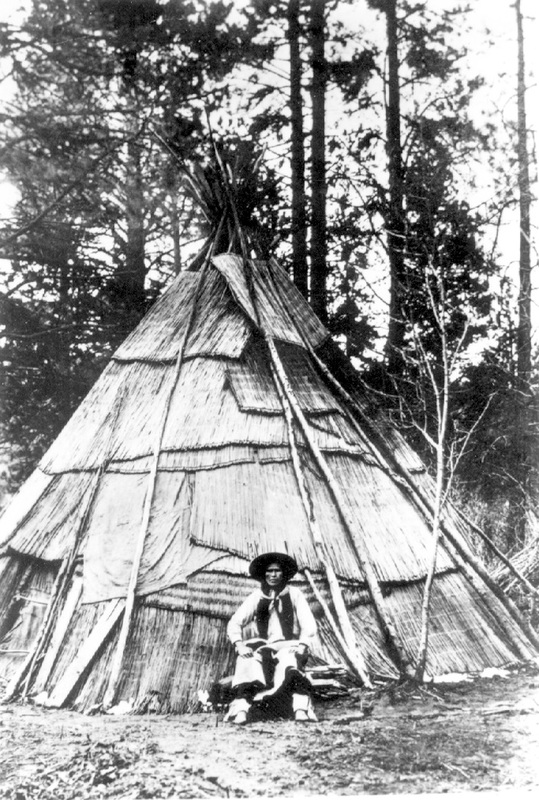 Meany took Joseph, in full regalia, to a UW football game as well, and Curtis visited the Colville Reservation, Later, Meany would accompany Curtis to the Plains states as the photographer set out to chronicle the peoples of what he thought a “Vanishing Race.” Indians have not vanished, and this linking of past and present, traditional and modern is a testament to, and an explanation for, their survival. 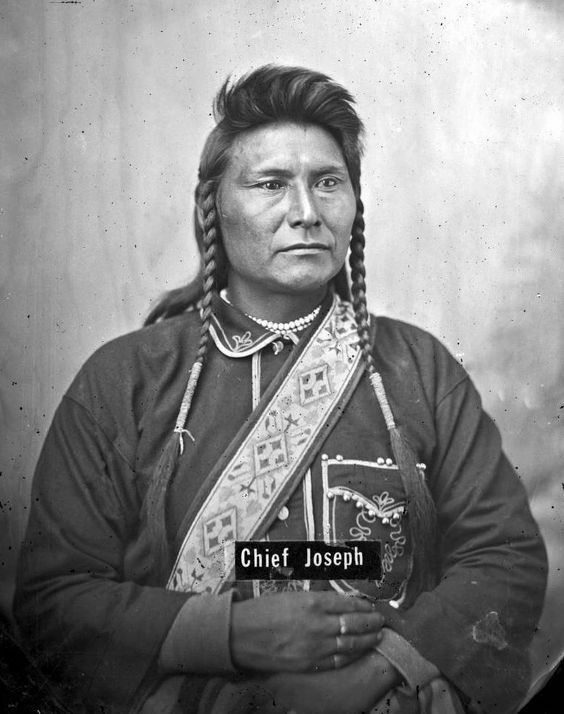 Finally, although the forced removal of the Nez Perce from the Wallowa Country in 1877 was painful and unjust, and Joseph’s attempts to return in the 1890s were greeted by contempt and derision, modern times have been kinder, and the future looks brighter for a Nez Perce presence in their ancient homeland. 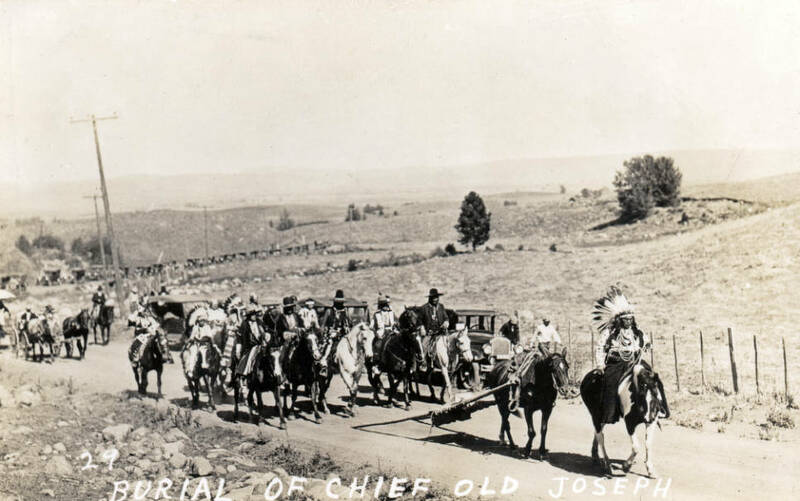 Old Chief Joseph’s grave was moved from a farm near present-day Wallowa to the place overlooking Wallowa Lake in 1926, and local school children walked up the hill to see the ceremony. Nez Perce Fisheries, operating under 1855 treaty rights, works to restore and sustain salmon and lamprey runs. Tamkaliks, an annual powwow and celebration, is held near the city of Wallowa each July, and a new Longhouse on the Homeland grounds was built and dedicated in 2016.